While Fengtaida was established in 2009, its GM Glen Qiu is a security veteran, with more than a decade of expertise in speed dome development. 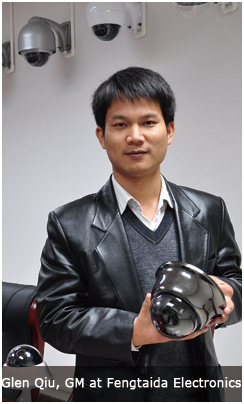 The company's priority is manufacturing quality speed domes. All of its products are subject to rigid inspections and testing before they are launched on the market. To ensure high standards, Fengtaida set up a sophisticated product laboratory - equipped with advanced electronic testing equipment and an air shower room. The testing facility includes a wide range of environmental test equipment, such as high- or low-temperature test instruments, vibration testing devices, corrosion testing boxes and more. Qiu believes that the company has strong in-house R&D capabilities and advanced manufacturing facilities. Fengtaida also boasts robust technical services and sound management to serve its partners. “We are ready,” he said.